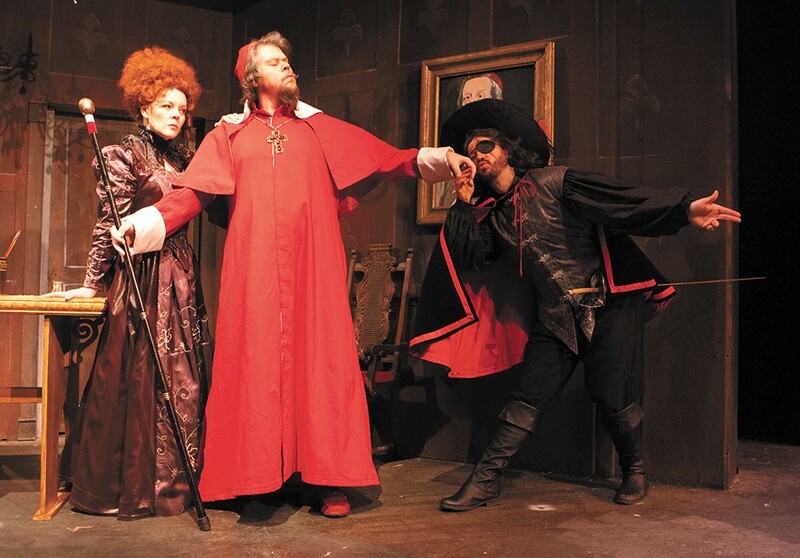 The Civic's production of Three Musketeers features all the intensity of the theater's take on Treasure Island last year. As a boy, Bill Marlowe would leap around his house sporting a towel for a cape, his father's fishing cap for a cavalier hat and wielding a broomstick for a sword as he enacted his favorite scenes from Alexandre Dumas' novel The Three Musketeers. "There were weeks of that. I terrified my mother and the cats and the dogs," he smiles. "I was just transported by the story." To the disappointment of his younger self, Marlowe never got to be a musketeer. Instead he would become Director of Drama at Spokane Falls Community College, a position that required less swashbuckling but offered more imaginative possibility. He also has a long history of directing at the Civic, where this season he's been allowed to indulge his childhood fantasies by directing a stage adaptation of The Three Musketeers, with all its swordplay, romance and intrigue. Several stage adaptations of Dumas' novel exist, among them a musical penned by a creative circle that included William Anthony McGuire and P.G. Wodehouse; but when Marlowe was in the reading and selection process, none seemed right. "I read one version of the play that had something like 38 scenes and 42 people, and it seemed operatic in size to me," he says. The adaptation he ultimately chose was penned by Ken Ludwig, whose reworked Treasure Island played last year at the Civic, and whose door-slamming farce Lend Me a Tenor ran earlier this season at Lake City Playhouse. "It was great to find a script that I thought was my kind of stuff. I liked it because there was a stronger sense of humor in the script." The play's humor, along with its novelistic consistency and careful departures, "grounded it in a family-oriented experience as opposed to just an adventure story." "When I read and then reread the book, I really liked the servants, because I think they give a real flavor of what the society is like," says Marlowe, noting that all three of the musketeers' servants feature in this adaptation. Plus one. "Ludwig has employed a very interesting theatrical device, which is that [D'Artagnan's] sister comes with him to Paris to go to school in a convent, and she disguises herself as a boy on the road. So it's become a pants role for a young actress." The Three Musketeers set is designed to be as impressive as its cast of 27 (many of whom reauditioned after their positive experience in Treasure Island) and its intricate combat scenes, choreographed by Bryan Durbin, who also plays Aramis. The two-story structure has five staircases. There will be two revolves on each side of the central set for "quick changes from interior to exterior." On stage right is the Cardinal's office. Stage left will transform into multiple locations. "It's very functional," says Marlowe. And it has to be, given the number of scene changes the story calls for. "You travel from the country to Paris, then to places around Paris, and then you're on the road to England, then you're at Buckingham's estate, then you're back in Paris, then you're at the palace, and in the garden and behind the Luxembourg. And then you're at the Siege of Calais and a cloistered abbey and a cathedral."